The problem with looking back is that you can’t see the future about to roll over you. In 1981, director Lucy Massie Phenix shot a celebratory documentary of the Highlander Research and Education Center’s 50th anniversary. The people at Highlander (a social justice leadership training center in Tennessee) could rightly look back at a half century of progressive successes — especially the previous 25 years that encompassed their contribution to the Civil Rights Movement. How could they have known that they were about to be swamped by the Reagan Revolution? It may have been “morning in America” for the right, but the sun was setting on the idea of social justice and the folks at Highlander. 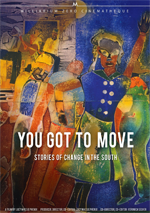 You Got To Move: Stories of Change in the South does a wonderful job in not making Highlander the hero but focusing on the people who came there and made a difference. This is the place where the civil rights version of “We Shall Overcome” was born, (something I did not know until I had seen the film). It was the place Rosa Parks had been a couple weeks before returning to Montgomery, Alabama, and then refusing to move to the back of the bus. Martin Luther King Jr. and Ralph Abernathy had been to Highlander too. Although this is powerful and historically significant stuff, you’ve probably never heard of the Highlander Center and perhaps you’ve got to move too. As Jon Stewart has said, the media has two settings: “Circus” and “Blackout”. If you’re part of the establishment media, you don’t want this kind of information spread around because an activist public is hard to keep in line. Indeed Highlander’s placement in the civil rights movement reminds me of the role played by the International Center on Nonviolent Conflict’s place in the Tunisian and Egyptian revolts of 2011. Have you ever heard of them? By 1981, Highlander had been involved in three areas of social activism in the South: labor-union organizing, civil rights, and environmental justice. There was a break with the unions in the 1940s over the issue of race. The integrated workshops offended some white union members and the local governments. You Got to Move skates over that rough patch and goes on to the glory years of the Civil Rights Movement. In fact Highlander had so much glory that in 1961 the state of Tennessee actually seized the land and buildings of Highlander and shut it down. The Center relocated (still in Tennessee) and soldiered on. The Highlander web site states that its mission shifted after 1961 “to other struggles for economic and social justice.” Those other struggles led Highlander to return to its Appalachian roots where the fight was all about poverty and strip mining. The part about the Appalachian activism seems tacked on to the end of the film. But in 1981, it was just the beginning of that environmental action and I understand why Phenix would want to show that Highlander was still vital and finding new purpose... and who knew how far the environmental movement might go? As it turned out, it was not very far at all. If there is one reason for reissuing You Got to Move, it’s to remind the viewer that we have come down a long road and perhaps it is an even longer road to get to where we need to be. But the point is you have to start somewhere. And who knows, maybe the idea of social justice can have its morning in America too. The new DVD has a really great set of extra features. Seen together, it is almost a second film. The best feature was a 1981 Bill Moyers Journal interview with Highlander’s founder Myles Horton. In her extra-feature comments, director Phenix says that the Bill Moyers piece was so good it allowed her to cover other subjects in the film. In 2007 Highlander Center observed its 75th anniversary and there is a short film about that celebration. It is interesting to see where the cutting edge of social justice is today. There are some familiar faces, the poor, people of color and some new players, LGBT and immigrants. There are also interviews with people in YGTM 25 years later, and it is interesting to see who is still alive and where they are today. You Got to Move is not a visually stunning film. This one is all about content. The sound is adequate but the music is great. Sweet Honey in the Rock appears twice, once in the film and again at the 75th anniversary party singing “Oh Freedom.” If that doesn’t get you going, there’s something wrong with you. Just watch it. It’s a great history lesson on what it takes to make a democracy really work. It’s as relevant today as in 1931, 1961 or 1981.